Knocked and scuffed walls are a common problem that can be easily avoided by the use of door stops. Door stops are a relatively cheap item of door furniture which are easy to fit, saving you both time and money, avoiding the need to replaster or redecorate your walls where doors have slammed into them. Follow this how to for details on selecting and fitting door stops throughout your home. Selecting the type of door stop that is most suited for the door and the door furniture fitted is where you should start. 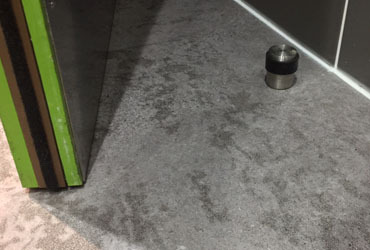 There are two common types of door stop available in a wide selection of finishes, either the fixed post type that are fitted to walls or skirting boards behind the door or the second type, which are floor fitting. Wall and skirting board mounted door stops are suited for all door types including heavy weight doors, whereas floor fixing door stops are best suited for use with lightweight doors or where there isn’t a mounting point for fixed post door stop. Once you have decided on the type of door stops to use you can buy them online or from your local DIY shop. Fitting wall and skirting board mounted door stops is an easy DIY job although care should be taken to ensure it’s fitted in the best location. If fitting the door stop to a cavity wall then locate a stud (wooden frame) for fitting. Open the door until its running parallel with the wall. Depending where you will be fitting the door stop use a pencil to mark the wall or skirting board behind the door in line with the edge of the door. Make a second mark at the same level but 3-4 centimetres away from the first mark, inwards towards the door hinges. Be careful when marking out the fixing points because if the door stop is fitted at a point that’s away from the edge of the door then it could damage or even worse, punch a hole through hollow-core doors. Once you have double checked the fixing points are marked out correctly, drill on each point to the depth and diameter suitable for the rawl plugs and screws provided with the door stops. Common fixing hole sizes are 6-8mm in diameter by 30mm depth. Once the holes are drilled, you will first need to insert the rawl plugs making sure they are pushed into the holes so they don’t project. Once ready you can fit the door stop, making sure it’s securely fixed and works when the door is opened. If fitting floor mounted door stops then similar steps are required, although marking out the fixing point will of course be on the floor. You should also leave between 10-15cm between the door stop and the wall behind, allowing amble space so the door handles don’t knock the wall. If you’re fitting door stops to ceramic tiled walls or floors then you may find our article on how to drill ceramic tiles helpful.